The South African female youth certainly made their mark at this year’s South African National Championships, fueled by the “Get the Girls to Gold” campaign. Myles Brown earned his second FINA berth tonight, upsetting training partner Chad Le Clos in the men’s 200m freestyle. 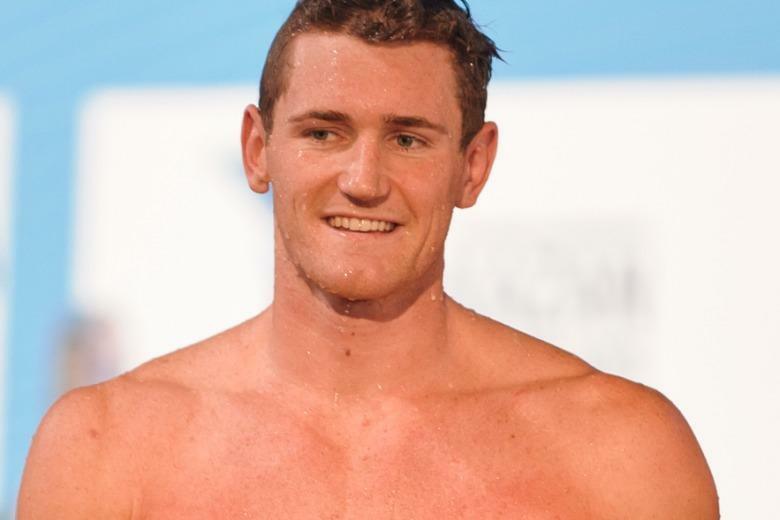 Cameron van der Burgh leads the 100 breaststroke field, clocking a Worlds-qualifying time in tonight’s semis, while countrymate Myles Brown makes history in the 400 free. The 2015 South African National Championships resumed today at the Aquatic Kings Park Center with some additional prime time swimmers in the water to take the competition’s intensity up a notch. Northern Tigers Swimming’s Vanessa Mohr stayed in the pole position of the women’s 100m fly race through heats and prelims and ultimately won the event tonight in a time of 1:00.21. Jessica Ashley-Cooper finished almost a second behind, touching the wall in 1:01.14 for runner-up, while Marne Erasmus finished in 1:01.46 to round out the top three. The men’s 50m butterfly final contained a 19-year age span, with the oldest competitor being Roland Schoeman age 34, and the youngest being USA’s Michael Andrew at just 15-years old. Man-speed ruled the race, however, as Schoeman took the win in a swift 23.69. Schoeman’s time falls within the world’s top 20 so far this year, but is just short of the Kazan qualifying standard of 23.53. Nico Meyer charged to the wall in 2nd, finishing with 24.24, followed closely by Ryan Coetzee. For his efforts, Michael Andrew registered a fourth place finish in the contest in a time of 24.49, not too far off of his personal best of 24.22. The women’s splash and dash was led by 16-year-old Erin Gallagher out of club KwaZulu Natal roaring to the wall in 25.93. A competitor ten years her elder swam into second place, as 26-year-old Trudi Maree clocked a time of 26.05, followed by Emma Forbes-Milne in third with a time of 26.60. Marlies Ross from Northern Tigers Swimming Club took the women’s 200m IM in 2:17.00. Ross actually added over a second from her semi’s time of 2:15.71, but was still able to hold off a swift Kirsty McLauchlan who finished in second (2:17.35). Rene Warnes came in third in the event, with a 2:18.66 for her efforts. 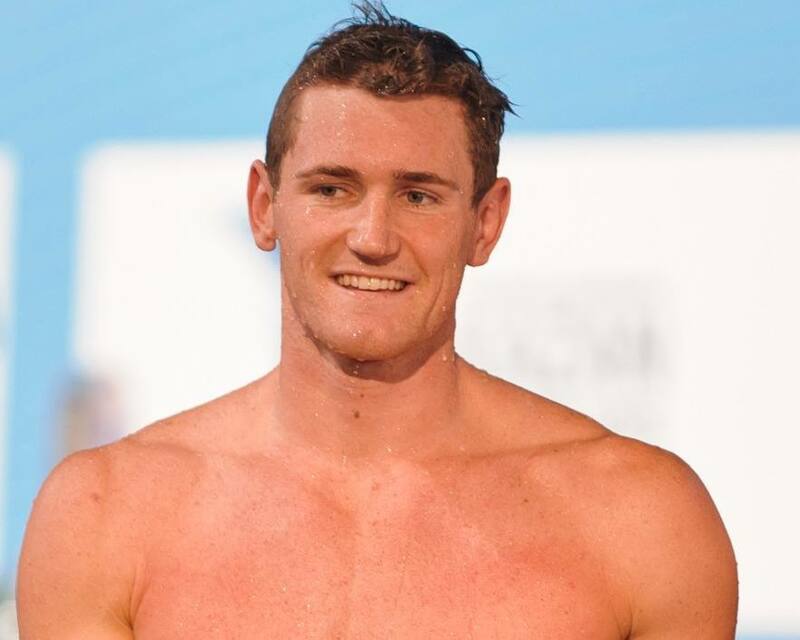 Some fireworks flew in the men’s 100m breaststroke event, with the South African master of the race, Cameron van der burgh, getting the job done in another sub-minute time. 59.78 is what VD Burgh threw down to win the event by over two full seconds, as well as slide into the 3rd-fastest spot on the world rankings, tying Felipe Lima. Only Great Britain’s Adam Peaty and Japan’s Yasuhiro Koseki have been faster so far this year, with times of 59.04 and 59.73, respectively. There were two runners-up to VD Burgh tonight as Marko Visser and Ayrton Sweeney tied for second place, both touching the wall in 1:02.27. For his efforts, USA’s Michael Andrew’s 1:03.05 clocking held him to a 5th place finish. Andrew has been as fast as 1:01.67 earlier this year at the Pro Swim Series – Austin. Western Province Aquatics wrapped up the women’s events with a win in the 800 free relay (8:33.10), while the men’s team from KwaZulu Natal took the men’s edition of the race in a winning time of 7:35.98. 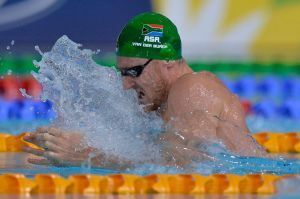 Men’s 100m backstroke – Neil De Villiers led the semi’s with his swift 55.87, dropping about 3/10 off of his seed time. USA’s Michael Andrew is positioned in 5th place from his semi swim of 56.18. For perspective, Andrew’s personal best is 55.73. Women’s 100m breaststroke – Tara Nicholas and Tatjana Schoenmaker were the two competitors to dip under the 1:10-threshold during semi’s. Nicholas is the top seed in 1:08.57 and Schoenmaker clocked a 1:09.39 for the 2nd seed. For her part, Nicholas is just about 2/10 off of the Kazan qualifying time of 1:08.36, so look for her to break out during tomorrow’s final in this event. Women’s 100m backstroke – Today’s backstroke sprint saw yesterday’s 400m freestyle winner, Karin Prinsloo, take control. She leads the field with a time of 1:02.21 out of semi’s tonight, but has some work to do to surpass the FINA cut of 1:01.25. Men’s 200m freestyle – After rather sluggish morning heats where no swimmer clocked a time faster than 1:51, the men turned up the volume in tonight’s semi’s. Le Clos was second after heats, but knocked over four seconds off of that time to register a new mark of 1:47.93 to now sit as the number one seed headed into finals. This time keeps Le Clos in the world’s top 25 and also qualifies him for Kazan, but is more than likely just a preview of what he may be prepared to throw down come finals. Flanking him in that final will be 2nd seed Myles Brown , whose swim also resulted in a Kazan qualifying time (1:48.01), and Sebastian Rousseau (1:49.32), both primed to try to steal the title from the Olympic champion. Not much better from Andrew. 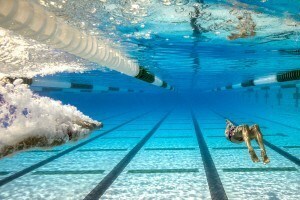 Let’s see now his backstroke today. Still not bad for being outside his normal training environment on a prolonged family vacation. It is not easy to train abroad living out of suitcases. I am sure the times will improve again by summer.